Week two is in the books! 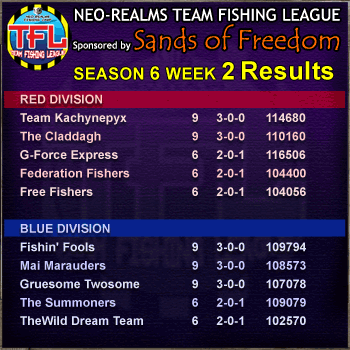 In Red Division: Team Kachynepyx and The Claddagh remain undefeated and on top, while in Blue Division Fishin' Fools, Mai Marauders and Gruesome Twosome remain undefeated. Good luck to all teams in the coming week! 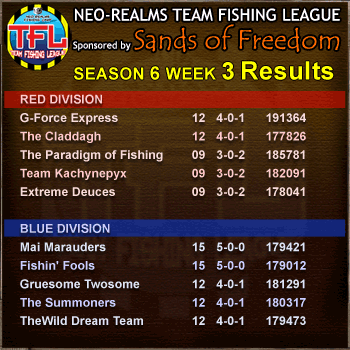 We're off and running with the first week's results in! Big numbers were posted by Lazy Cats and G-Force Express in the Red Division with 40k+ points! 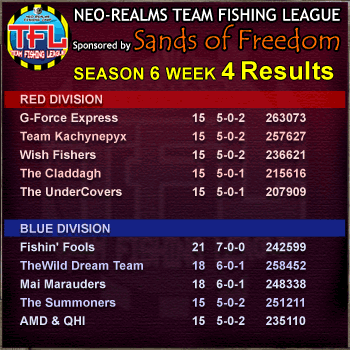 Fishin' Fools and The Bings also lead Blue Division. This week has up to 2 matches being contested for the week. Good luck to all teams! Each player has received 114 levels for the season to spend as they see fit. The first matches must be completed by the end of Sunday, February 19th. The results of those matches will be posted Monday. Good luck to all teams this week!